Earlier this month, Trey and I went on a four night get away to Las Vegas. If you have ever been inside of any of the massive, gorgeous casinos in Las Vegas, you are aware of the signs. If you are looking for a certain store, the restroom, the exit, or the escalator in a casino, you have to follow the arrows on these signs. The arrows take you through the entire casino, sometimes even in a complete circle if you aren’t careful. The goal would be for you to make a few stops at a machine or a table on your way to your destination. They want you to get distracted. I have been distracted. I have been focusing on Baby Bell and doing everything I can do to pray and pray and pray for our healthy, beautiful twin miracles. I have been looking for the arrows to the easiest way from point A to point B. My husband and I just want biological babies to raise together. We want to experience pregnancy and parenthood together. We have prayed for God to hear our pleas. I have not mentioned my cysts or my stupid lining to God lately. I’ve been too caught up in praying for miracle babies. I haven’t thought to ask God to heal my cysts. I’ve been going in circles. I need to take care of Kari first. We need to get ME healthy, then we can get back to our precious miracle twins. Last Wednesday night, as I poured my heart and soul out to anyone who would listen, I told someone “I just don’t know how to pray for this anymore”. My mind was completely blank. I had prayed every way and every prayer I could think of. The sweet soul who allowed me to cry on her shoulder said the sweetest thing to me. She said, “We will pray you through this. Sometimes we don’t know what to say and we forget things, but then there are other people who remember things and are filled with words.” I need you to pray me through this. Just like a person with cancer prays for their body to be healed, I’m praying for my body to be healed. I’m praying for my doctors and nurses to have the knowledge and God-given talents to see my chart and know what they can do to give me relief. If you aren’t a believer in medicine… i.e. Tylenol, Ibuprofen, Provera, Follistim, IUIs, IVF, etc… please do not give me 83564 reasons why I’m wrong in wanting to pray for my doctors and nurses. This isn’t something I can “just relax” and it will go away. It isn’t something I can just eat grass-fed beef and home grown turnip greens and it will miraculously go away. This is something I have had for a LONG time, but it didn’t make it’s way to the surface until I stopped taking birth control pills and started trying to get pregnant. So I’m begging you, just pray for me. You don’t have to tell me you are praying for me. You don’t have to share your cousin’s neighbor’s sister- who- had- tried- for -4 -months- to- get- pregnant story. Just pray for me. Pray I do not have to have another surgery. Pray I do not lose an ovary. Pray I am able to get some pain relief soon. Yesterday was by far one of the most emotionally challenging days I have had during this eighteen month journey to bring home a healthy baby. At one point I even asked God, “Where are you? ‘Cause I definitely do not feel You right now! ?” Yeah. I was upset, sad, heartbroken. I realize I’m not supposed to question God or His will, His plan, etc. etc. etc. Well I did. I’m sorry. I did. Stay with me. I have a point. On Monday, I went for a nice long run / jog around the neighborhood. I did not have my headphones with me. It was just me running my little heart out trying to clear my head. Last week we received Trey’s results from his gene sequencing test. We were expecting a call from NFC any day now with our next steps. Low and behold, I received “the call” from NFC almost as soon as I made it back to the house. When I answered the phone, my sweet nurse informed me they are ready to move forward. She told me to go ahead and order the rest of my Follistim and Ovidrel so I would have all of my meds when my cycle started. The craziest thing happened Monday evening. I started bleeding. I was super, duper, over-the-moon excited! This is it! We FINALLY get to start our injections and God is going to hold my hand and be with me through all of it and I’m not going to be scared…and… and… maybe we will be pregnant with our miracles soon! The excitement was overwhelming! I could not wait to call the clinic the next day to let them know I was ready to come in for my baseline ultrasound and blood draw. Tuesday morning (yesterday) I called the clinic right at 8:01 AM. The receptionist was very kind and almost seemed excited FOR me! It was great. She told me to be at the clinic before 11 and they would do my ultrasound and blood draw. I could barely contain myself at work. I was jumping from one thing to another. I was constantly looking at the clock and counting down the minutes until I could leave for Nashville. I kept thinking, “This is amazing! We are so blessed that God led us to NFC!” I arrived at NFC at 10:47. Shew. I could barely sit still in the waiting room. I got out my phone and started looking at pregnancy announcement ideas on Pinterest. I just KNEW this would be it! I just knew this would be the cycle God would bless us with our miracle(s)…. Come to find out, the bleeding wasn’t my period. In fact, I haven’t had a period since December. I have not shed the lining of my uterus in over 2 months. It has just been building up and building up waiting for my ovaries to release an egg. My ovaries haven’t released an egg because my ovaries just plain don’t work the way normally functioning ovaries should. This isn’t a newsflash. This is something I’ve known for the past few years. I have 2 cysts the size of quarters on my right ovary. I’m back at square one. The nurse said it wouldn’t be safe for me to start an injection cycle with the cysts on my ovaries because the cysts would absorb all of the FSH and they would just get bigger. She also said my lining was entirely too thick already and we didn’t need to risk making it any thicker. We are out this cycle. So that’s that. I did my best to keep my happy face on while I was in the clinic. One of the nurses was really apologetic. I told her, “Oh I’m use to it. We will just try again another time!” The truth is, on the inside I wanted to scream. I wanted to bust through the exit doors and just cry my eyes out. I convinced myself I could make it to the elevator before I started crying. Well, I made it to the elevator, but there was someone else on it. I couldn’t lose my mind in front of a stranger, so I made myself wait until I got to the parking garage. Yep. I was the lady in the Centennial Medical Center parking garage who was curled up in a ball beside her car, dumping her purse looking for her keys, and crying her eyes out. That. was. me. I don’t even care if anyone saw me. I was sad. I was disappointed. I was heartbroken. The drive back to work from Nashville was not fun. Every song on the radio annoyed me. That “Hey Pretty Girl” song came on and made me cry. I called my Granny. She made me cry. I passed a car with 2 toddlers in the backseat. That made me cry. Long story short: I cried a lot on my hour and a half drive back to work. 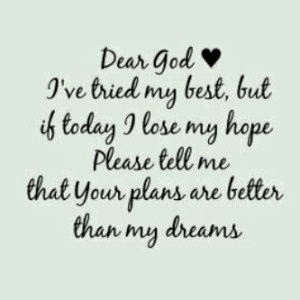 I know God has an amazing plan. I know He is the only One who can overcome infertility. I’ve said it before and I will say it again, when we finally have our healthy little miracle baby, God will get ALL of the glory. It is because of Him that every child is born. It is because of Him that any child is conceived. God gives the doctors and nurses the knowledge and ability to help couples, but GOD IS THE ONLY ONE WHO CAN OVERCOME INFERTILITY. I know He was with me yesterday even though it felt like I was so alone. I know yesterday was all part of His plan. I know one day I will look back on February 18th and think, “God was molding me for something better that day!” I know all of these things. I know He is always with me. I know this. I really really do, but at the same time I’m sad. I just knew our blessing was coming soon. I just knew God had wrapped me up and taken complete control of this situation. I just knew it. I had allowed myself to get my hopes up. I was at peace. I was excited. Now … I’m disappointed. I’m sad. I’m heartbroken. I’m … I’m… at a loss. My hands are open when I pray. I pray every single way I can think of. I pray long prayers. I pray short prayers. I pray for my body to heal. I pray for God to restore the fruitfulness of my womb. I pray for this to not happen to anyone else I know. I am super careful what I eat and drink. I exercise. I pray for God to use my situation so I can help someone else if it be His will. I don’t know what else to say. What have I done wrong? Why do I still have these cysts? Why do my ovaries not work? Why can’t I have a period like a normal woman? Why can’t I give my husband a child? Why? Why? Why?!? Please remember me in your prayers this week. I’m so weak right now. I am at a loss. I know only God can take away the physical pain and discomfort I feel (along with this huge non-pregnant belly). Please pray for healing…physical and emotional. We celebrated Trey’s 29th birthday. We traveled to Las Vegas for a much needed 4 night getaway. If you have never been to Vegas, add it to your to do list RIGHT NOW! It is gorgeous. I had an extremely challenging week back to work. We received our results from Trey’s gene sequencing test. He is NOT also a carrier for CF. So now we are back to doing an injectable and IUI cycle sometime in the next few months. Yay! Belly shots! I promised myself I would stick to a healthier lifestyle…for our children. I finished reading Pregnant With Hope . Now that you know the highlights, I will dig into the important stuff. The story of Hannah has been heavy on my heart lately. I actually saw a pregnancy announcement yesterday with 1Samuel 1:27 in it. **It was one of those slideshow announcements. ** Hannah has a beautiful story. The first time I read the story of Hannah and her desire to become a mother, I had just lost my second baby. A co-worker at the time had sent me a card or a note with the scripture written in beautiful handwriting. I didn’t realize how important that scripture would be to me until several years later. Here I am. I’m constantly going back to that verse and being reminded of God’s power. Only God can overcome infertility. Doctors and nurses may have the God given talents and knowledge to help, but God receives all of the glory for overcoming infertility. Every. single. child. is a blessing from God. In Hannah’s time, infertility was a source of shame and humiliation. Like myself, Hannah was strongly influenced by her culture. Women were having baby after baby after baby in Hannah’s time. Hannah was barren (the phrase “her womb was closed” is often used in the Bible to reference infertility) and unable to conceive a child. She felt like she didn’t fit in. Sometimes I feel like I don’t fit in. Hannah drew her self-esteem from what others thought she should be like. Did you catch that? Hannah drew her self-esteem from what others thought she should be like. I draw my self-esteem from how others think I should act, pray, or feel. I have caught myself several times lately letting how others think I should act or feel make me feel …. gasp…. unworthy or like I’m not doing something right. I have felt like something is wrong with me when I have a hard, trying day and I want to cry. I have felt like I’m not supposed to be upset when I receive news that I’m out another cycle. I have cried at the sight of my period only to be told, “This is God’s plan. You shouldn’t be upset.” I am then upset and feel like something is wrong with me because I’m upset and I’m not supposed to be upset. It doesn’t help. At. All. It is such a vicious cycle. Several months ago, I saw a therapist once a week. Yeah. I said it. I was in therapy. While in therapy, I was encouraged to write down everything positive I had in my life. I was told to keep a list of rational thoughts with me and pull out my list whenever I felt myself slipping into a sad hole. If someone said something to me that made feel like less of a woman, I was to really think about what the person was saying, determine if it was meant in a different way than the way they said it, and not let it get to me. I was also encouraged to consider the source. Was this person trying to be helpful or hurtful? Was this person familiar with my feelings and situation or were they being judgmental of me. Folks, I struggle with this. I then look at Hannah’s story and realize, I’m not the only person who struggles with it. I’m sure there are people reading this post right now and nodding their heads. Yep. I’m not the only one! Hannah was taunted by the women around her who so easily conceived and carried children. I have not been taunted per se, but I can relate to Hannah’s feelings of low self esteem. It took a lot of tearful prayers for me to finally overcome my feelings of inadequacy and unworthiness. I encourage anyone who is reading this to pick up or download a copy of Pregnant with Hope. There is a section about Hannah as well as a section about Abraham and Sarah. It will change your outlook. God has His fingerprints all over that book. If you are in a sad hole, please let me know so I can add you to my prayers. If you just need prayers this week, let me know that too! I feel encouraged when I know others are praying for me. I would love to pray for you.